Don’t be caught napping when the Aboriginal Centre for the Performing Arts acting department presents Shakespeare’s mischievous fairy frolic A Midsummer Night’s Dream (abridged by Gerald P. Murphy). With two free shows on Thursday 30 August at the Judith Wright Centre of Contemporary Arts in Brisbane, seats are selling out fast. 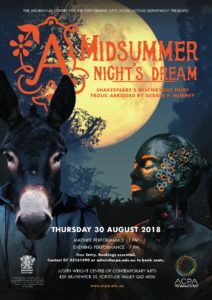 To find out who’s dreaming and who’s a donkey, call 3216 1490 or email admin@acpa.edu.au to book your tickets for the matinee at 1.00 pm or the evening performance at 7.00 pm.